The art involved in designing and building a seaworthy vessel is always impressive. But the skill it takes to build a seaworthy vessel completely by hand, using only natural, sustainable, eco-friendly materials, is rare and demonstrates an “old world” tradition matched with superior craftsmanship by today’s standards. It was a voyage on a friend’s family sailboat in Southern California where he grew up that hooked Captain Dave Ryan of Montauk on a life of sailing. In fact, his admiration for the art of building boats inspired him to create his first 38-foot catamaran more than 15 years ago. Unfortunately, it was destroyed by lightning, but it wouldn’t be long before the concept for Mon Tiki, Ryan’s newest vessel, a Polynesian-style 38-foot catamaran, would be put into action. Captain Dave worked with an eclectic group of craftsmen and craftswomen during the fabrication and building of Mon Tiki. The job requirements and relevant skills for his crew were interesting, to say the least, and included: painting, baking, sewing, carpentry, tile work, and most importantly a positive attitude. So, with the assistance of a student, a homebuilder, a musician/carpenter, and an artist — as well as his wife, Amelia, and daughters, Margaret and Emily — Mon Tiki began in late December of 2011. The project took nearly eight months to complete and the finished product is something quite remarkable. “Recycling old ideas and creating incredibly robust fabrications takes a combination of old technology and modern materials,” say Captain Dave. During our conversation, I learned how epoxy resin (a modern material) is, in fact, comparable to a key ingredient a baker would use in a recipe for a decadent dessert. The entire catamaran is built with the finest quality materials. The hull skin is made of Lloyds of London certified BS 1088 Meranti marine plywood with a fiberglass/epoxy skin, which adds to its cohesiveness, strength and durability. The hull stringers and other lumber is composed off vertical grain clear Douglas fir from Oregon, the masts are hollow wood also made of vertical grain clear Douglas fir, and the deck is completely made of mahogany. With top grade materials and a design by renowned engineer James Wharram, this 38-foot sailing vessel was built with precision. By using low-impact construction techniques, Mon Tiki is a low-emissions and low-stress vessel. “This is the only lashed boat on the East End,” said Ryan. Mon Tiki, which will be a U.S. Coast Guard Inspected Passenger Sailing Vessel when it sets sail, was not only created for tourists, but also for students. It doubles as a kind of “floating classroom.” Ryan believes that by providing this unique opportunity, he’s able to give back not only to the community, but also to aspiring sailors and admirers of the sea. “I love the stillness and quietness of sailing and I believe that Montauk is a porthole to the stars. People sail to enjoy the environment; the sun, the wind, the ocean breeze and the entire experience of the sea, that’s what our guests will have,” shared Ryan. The name Mon Tiki pays homage to Thor Heyerdahl’s famous 1947 Kon Tiki voyage from South America to Polynesia. It took that crew 101 days to journey 5,000 miles to the Pacific Island, but aboard this new vessel, guests will get to experience the same peacefulness and freedom of open-ocean sailing in a matter of minutes. 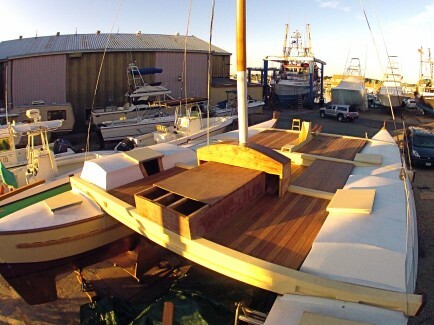 PreviousPrevious post:The count-down to launching MON TIKI begins!NextNext post:Giving MON TIKI Her Mahogany Decks!